I’m very much an anti-hype, anti-bandwagon person. I neither like to nor want to get caught in the undertow of the emotional rush associated with being excited about something that nearly everyone else seems to be excited about, where everyone celebrates the new and “cool factor” with little-to-no critical thought. When that next bright and shiny object comes along, it’s all too easy to be blinded by it. Rest assured I have not been blinded by #socialrecruiting. I’ve been using social media for a little while now (Twitter, LinkedIn, Facebook and blogging), purposefully remaining calm and collected on the subject – choosing to explore the true potential rather than get caught up in the hype. So whether you’re a social recruiting evangelist, hater or n00b (I’ve been all 3, not necessarily in that order), you’ll find some value in this post because I am going to strip away all of the hype surrounding social recruiting, demystify it, and cut straight to the heart of the real opportunities associated with using social media for sourcing and recruiting. So What’s the Big Deal About Social Media and Recruiting? Many people want to know – what exactly IS the big deal? Well, from my perspective, the advent of social media affords sourcers and recruiters with easy and unprecented levels of access to more people than ever in the history of recruiting. Using just the “Big 3” social networks, recruiters have the ability to find, communicate with, engage, and build relationships with well over 100,000,000 million in the U.S. alone. That’s always been my question! As if there ever was antisocial recruiting? “Social recruiting” is simply the use of social media and social networking sites to find, engage, communicate and build relationships with potential candidates with the intent to network and recruit. However, using social media to communicate and build relationships with potential candidates is no more “social” than using the phone to do the same thing, or actually doing it live and in person (that still happens, right?). To demystify social recruiting, it is simply the use of specialized Internet-based technologies and websites to perform the same standard and basic recruiting practices that have been conducted over the phone and in person for decades – finding candidates, initiating contact and engaging candidates, and building relationships with candidates. Suppose you only use a social network such as LinkedIn to find potential candidates, and you use other means to initiate contact and engage them – isn’t that social recruiting? I don’t think it’s so black-and-white an issue. If I identify a potential candidate on Facebook or Twitter, cross reference them on LinkedIn to find out where they might currently work, use the phone to initiate contact with them, then invite them to connect with me on Twitter and LinkedIn as an additional way for me to stay in touch with them – is that not social recruiting? I’ll let you decide, but I think the answer is obvious. Isn’t Social Media Just a Big Waste of Time? 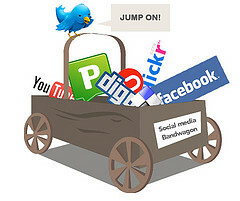 Can a recruiter waste a lot of time using social networking sites? Most definitely. But don’t be silly – social networks don’t waste time, people do. When it comes to social recruiting – one size does not fit all. If you’re hiring Information Technology professionals, you can easily use social media for recruiting and get results. That’s because there are many I.T. professionals using social media. However, social recruiting won’t work so well for you if a large percentage of your target talent pool isn’t using social media. For example, Jerry Albright has observed that many groups of candidates seem nowhere to be found on Twitter. Jerry’s a recruiter, he’s social, he blogs, he’s on Twitter– and yet recruiting with Twitter still eludes him for one simple reason: the kinds of people he typically recruits for are scarce on Twitter. When it comes to fishing – you go where the fish are. When it comes to recruiting – you need to go where the people are. If the people you need to recruit aren’t on certain social networks, you obviously don’t need to go there to be a successful recruiter and to get results. Companies have an unprecendented ability to engage millions of potential candidates where they live online – at little to no cost. As I said before – when you’re recruiting, you go where the candidates are. When you can create a Facebook Fan Page to represent your corporate brand, socialize your hiring needs, communicate hiring events and post videos to attract talent for free on a site where there are over 130,000,000 monthly unique visitors from the U.S. alone (sorry, www.compete.com only shows U.S. data), why wouldn’t you? When you can create a corporate Twitter profile for free to communicate in real time with 1,000’s of people who are interested in your company, why wouldn’t you? However, companies that limit their “social recruiting” efforts largely to posting jobs on Twitter, Facebook and LinkedIn aren’t really performing social recruiting in my opinion. Job posting is job posting – there’s nothing “social” about it. Social media and social networks that enable and facilitate social interaction have without a doubt given recruiters unprecedented access to large populations of potential candidates where they live online, but social media is no more “social” than attending a user group/networking event or simply picking up the phone and speaking with a potential candidate. Social media simply gives sourcers, recruiters, and employers one more way to find and interact with potential candidates – sites such as LinkedIn, Twitter and Facebook are not replacements for in-person or telephonic interaction. The basics of the “human element” of recruiting – effectively communicating and building relationships with candidates, understanding candidate motivators, consultative selling, etc. – none of these have been changed or altered by the emergence of social media. Social media and social networks merely give recruiters a 3rd medium through which they can perform the same thing all good recruiters have been doing over the phone and in person for decades. Having said that, I do think that a recruiter or recruiting organization that effectively leverages all 3 mediums (in-person, over the phone, online) will outperform anyone who is only leveraging any 2 of the 3. If you happen to be a social recruiting non-believer, please know that you aren’t qualified to say that social recruiting doesn’t work for you or your organization unless you’ve actually tried it in the first place, beyond posting jobs on Twitter and LinkedIn groups and creating a Facebook Fan Page. Bottom line – you should use recruiting methods that work for you and produce the best results – not what the industry is buzzing about.